I’m an American expat from Central Illinois who moved to the Philippines over nine years ago. I’ve been married to a loyal, loving Filipina for over 19 years. “EXPAT Safety & Security: PHILIPPINES” has never been more important. The Communist insurgency group, New People’s Army, NPA, is ramping up attacks in our area, Western Visayas. PNP Chief “Bato” Dela Rosa recently declared that the Communist thugs are targeting our region. The threat of radical Islamic terrorism is continuing to grow in the Philippines with groups like ISIS stepping up recruitment efforts here. With promised cash bonuses of 100,000 pesos, $2,000, to anyone who joins their cause, their ranks are swelling. 100,000 pesos is a lot of money in the Philippines. President Rodrigo Duterte expressed his apprehension over the growing threat of terrorism as rebel groups might regroup and unite as an affiliate of ISIS in the country. “These terrorists, the New People’s Army and the rebellious factions in the Moro land are affiliated with ISIS,” the President said. In addition to having lived in the Philippines full-time for over eight years, I’ve had prior experience as a Security Specialist in the United States Air Force, Strategic Air Command, SAC. Though my service has been many decades ago, I still maintain my edge. I exercise caution anywhere I travel in the Philippines, whether it be our home province of Guimaras or Metro Manila. I take nothing for granted. My head is always on a 360 degree swivel, always looking for any potential threats. In this new E-book I cover such topics as “Dogs, Guns, & Guards” and give you tips on the best breeds of canines to use for your own personal security at home. Perhaps you want to ramp up your security and arm yourselves. I’m not talking about buying some Airsoft gun that won’t kill some intruder, I’m talking about a real firearm. Of course, your Filipina wife can purchase a weapon, if she jumps through spools of red tape. But this book will tell you how to buy firearms in the Philippines without going through all the hassles of government bureaucracy. And, most importantly, this guide reveals the startling secret of how to purchase your weapon LEGALLY. Maybe you want to hire your own personal security guard? 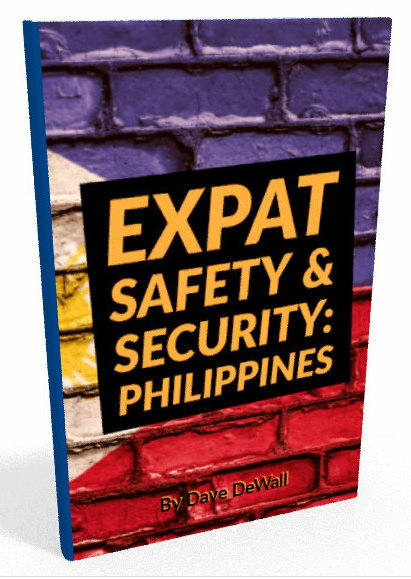 “EXPAT Safety & Security: PHILIPPINES” covers that topic. “How Safe is it to Visit the Philippines” is another important topic covered in this book. What are the biggest risks? What are the overlooked risks? How can you lessen those risks? I’ve woven personal accounts of our own security and safety issues from past experiences in the Philippines throughout the book. If you’re planning a trip to the Philippines this guide will give you invaluable information and advice that will make your visit to the PH easier and safer. Or maybe you’re a future expat and are concerned about all the recent terrorist activity in the Philippines. “EXPAT Safety & Security: PHILIPPINES” will provide you with practical advice on how to protect yourself from crime in the Philippines.